We're rounding up all the chicest arm parties in town and you're invited! Check out these ladies' super stylish arm pieces and get some inspiration for a soirée of your own. We want in on this cool-kids-only arm party. The standout bracelet pulls you in and the rings keep the fun going. It's like a chic chain reaction. Once the arm party fun starts it's hard to stop, hence the gorgeous ring collection. You'll definitely be the life of the party with fun and bold bangles like these. More punch anyone? All eyes will be on you in a cool yet statement making cuff like this. You'll fit right in at an artsy shindig with these cool minimal cuffs. Talk about making your presence known! We just love a stand-out arm piece. Beads & gems and patterns, oh my! Spikes, metallic bugs and chains will definitely serve as conversation starters. 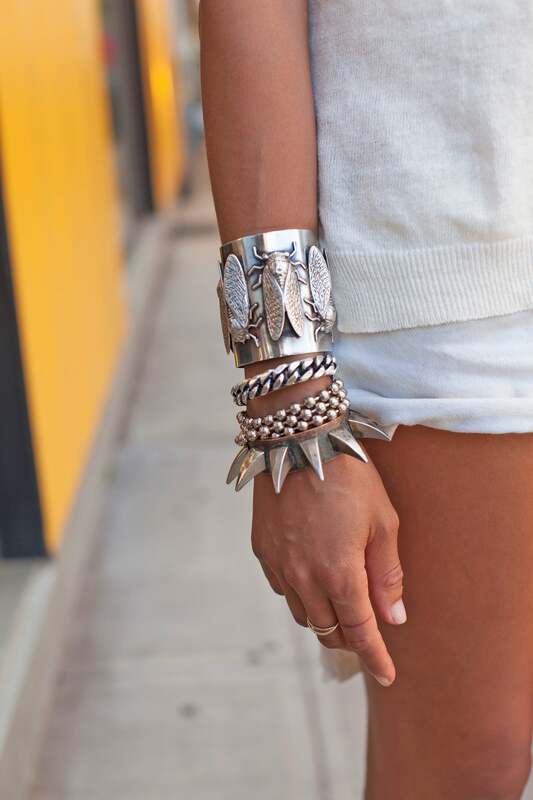 Think outside the jewelry box and mix a chunky chrome cuff with small & edgy bracelets. A low-key hang-out session is the perfect destination for these cool and calm cuffs. It's a celebration! Eye-grabbing colors, swinging tassels and elaborate beading lend to quite an arm party. A stack of dainty detailed bracelets creates one of our favorite arm parties of the year. They'll be talking about this arm party for years! A bold, brassy cuff and a geometric bracelet came together to create the perfect soiree of an ensemble. Time is on her side in this festive yet punctual arm party.